The definition of infrastructure as I defined it in my book is based on the IT systems model as shown below. In this model processes use information, and this information is stored and managed using applications. 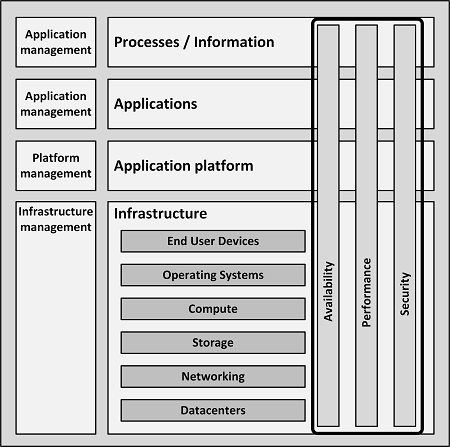 Applications need application platforms and infrastructure to run. All of this is managed by various categories of systems management. Organizations implement business processes to fulfil their mission and vision. These processes are organization specific – they are the main differentiators between organizations. As an example, some business processes in an insurance company could be: claim registration, claim payment, and create invoice. Business processes create and use information. In our example, information could be the claim’s date or the number of dollars on an invoice. Information is typically entered, stored and processed using applications. Functional management is the category of systems management that ensures the system is configured to perform the needed business functions. Client applications typically run on end user devices like PCs and laptops. Examples of client applications are web browsers, word processors, and email clients. Office applications provide standard server based applications most organizations use. Examples are mail servers, portals, collaboration tools, and instant messaging servers. Most organizations run these office applications more or less out of the box. Business specific applications are applications that are typically highly customized or custom built. Some examples are Customer Relationship Management (CRM), Enterprise Resource Planning (ERP), Supervisory Control And Data Acquisition (SCADA) systems, and applications that are created for a specific business process (like an insurance management system). Applications management is responsible for the configuration and technical operations of the applications. Front-end servers are typically web servers (like Apache HTTP Server and Microsoft Internet Information Services – IIS) that provide end users with interactions to applications by presenting application screens in web browsers. Application servers act as containers running the actual application. Examples are Java or .Net application servers and frameworks (like IBM WebSphere, Apache Tomcat, Red Hat JBoss, and Windows .Net). Connectivity entails FTP servers, Extraction, Transformation and Load (ETL) servers, and Enterprise Service Buses (ESBs) like Microsoft BizTalk, the TIBCO Service Bus, IBM MQ, and SAP NetWeaver PI. Databases, also known as database management systems (DBMSs), provide a way to store and retrieve structured data. Examples are Oracle RDBMS, IBM DB2, Microsoft SQL Server, PostgreSQL, and MySQL. 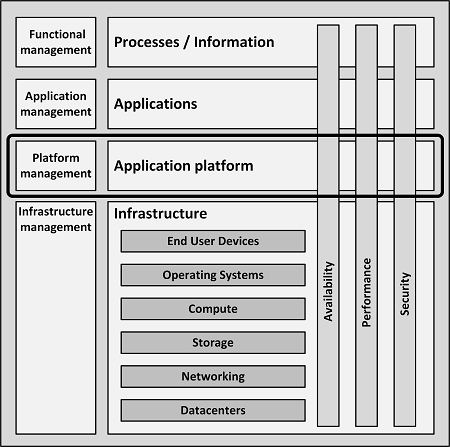 Application platforms are typically managed by systems managers specialized in the specific technology. End User Devices are the devices used by end users to work with applications, like PCs, laptops, thin clients, mobile devices, and printers. Operating Systems are collections of programs that manage a computer’s internal workings: its memory, processors, devices, and file system. Compute are the physical and virtual computers in the datacenter, also known as servers. Storage are systems that store data. They include hard disks, tapes, Direct Attached Storage (DAS), Network Attached Storage (NAS), and Storage Area Networks (SANs). Networking connects all components. This building block includes routers, switches, firewalls, WANs (wide area networks), LAN, dial-in, internet access, and VPNs (Virtual Private Network), and (on the network application level) relatively simple services like DNS, DHCP, and time services, necessary for the infrastructure to work properly. Datacenters are locations that host most IT infrastructure hardware. They include facilities like uninterruptible power supplies (UPSs), Heating, Ventilation, and Air Conditioning (HVAC), computer racks, and physical security measures. Please note that these building blocks are not per definition hierarchically related. For instance, servers need both networking and storage, and both are equally important. Infrastructure management includes processes like ITIL and DevOps, and tools like monitoring, backup, and logging. An IT system does not only provide functionality to users; functionality is supported by non-functional attributes. Non-functional attributes are the effect of the configuration of each IT system component, both on the infrastructure level and above. Although many other non-functional attributes are defined, availability, performance, and security are almost always the essential ones in IT infrastructure architectures.